I've gotta say, I love reader participation! 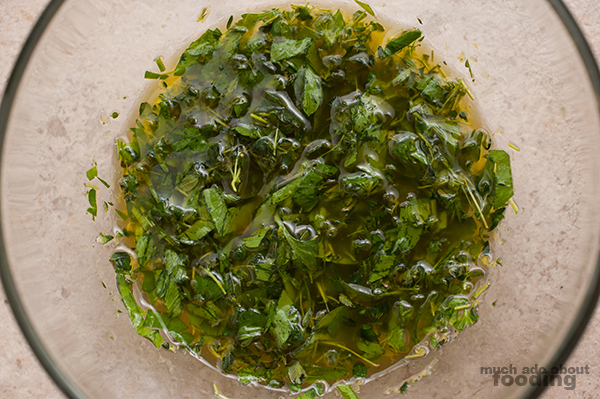 Last week's Test Kitchen ingredient was not too tough of a challenge which is great for anyone else using fresh thyme. Duc has been growing an abundance of it lately, so we wanted to put it to the test. Reader (and good friend) Ronald amused us with a LOTR gif and suggestion of using it with potatoes. 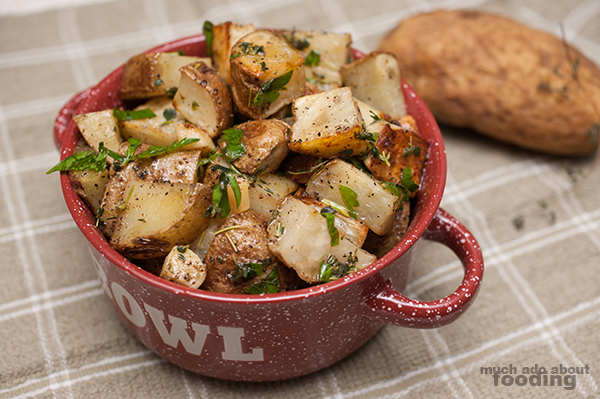 That sounded like a fine idea and who doesn't love a solid side of potatoes? We chunked these and tossed with a lemon-thyme dressing to make a recipe simple enough for anybody to give a try. Check it out for yourself! I like to leave the skin on on my potatoes. It gives a great texture, crisps up nicely when roasted, and contains quite a bit of vitamins you lose when you toss them. That being said, make sure to scrub off all the dirt well before you use them! 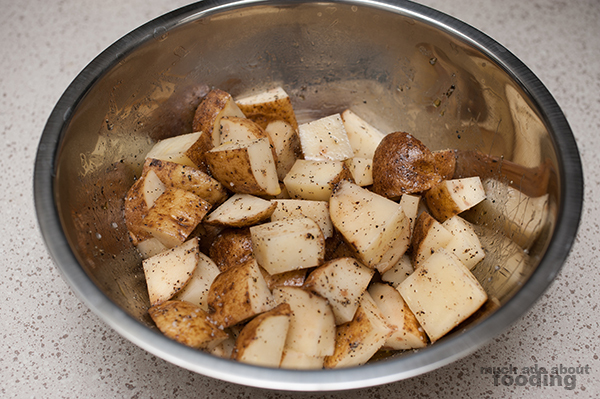 In a large mixing bowl, toss together potatoes (cut up into bite-size chunks) with quartered garlic cloves, olive oil, salt, and pepper. Let sit for about 20 minutes before spreading out onto a large baking sheet. Pre-heat oven to 425°F. 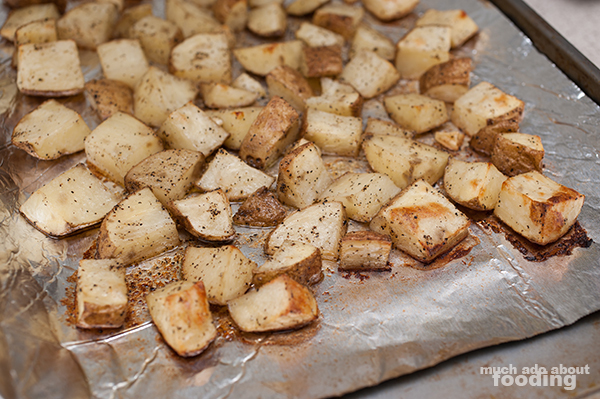 You'll roast the potatoes in the oven for 20 minutes or just until the cut sides and edges get a crispy brown. Feel free to leave it in a little bit longer than I might have if you want extra crispy. In the meantime, put together your dressing! Whisk together olive oil, lemon juice, lemon zest, thyme, and parsley. The lemon will help cut into the saltiness of the potatoes. 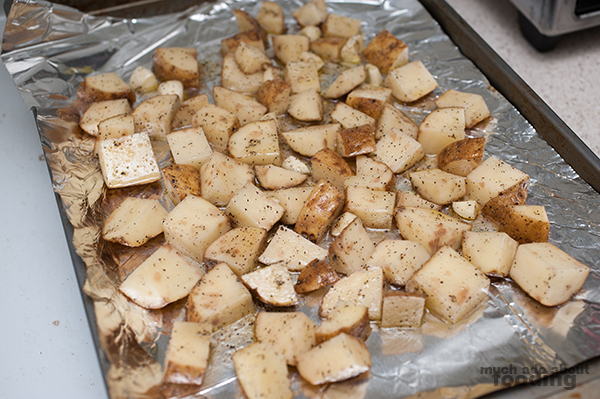 When the potatoes are ready, remove from oven and let cool slightly. The beauty of this dish is that it's good to eat whether warm or cold. 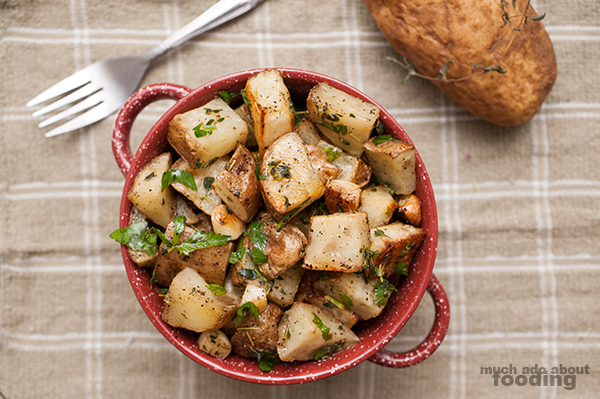 Toss potatoes with the dressing and serve at whichever temperature you prefer. We had them both ways and both were tasty! 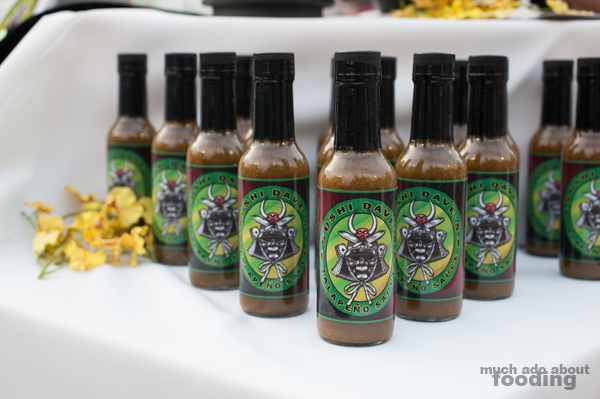 We came across this particular jalapeno sauce during our attendance at Riviera's "To Live and Dine" 2013 event. I got a bottle to try and cook with, and the story was a bit intriguing seeing as how the sauce was an accidental creation. I'm all for happy accidents in the kitchen (hence the experimental cooking sometimes)! The other point of interest is that the sauce is created by jalapenos sauteed with sake so think on that a little bit. If you have suggestions of what to do with it or what you want to see me create, please share your thoughts when the picture goes up on Facebook (and "like" the page too)! Thanks, readers. Photography by Duc Duong who ate almost all of the potatoes in one sitting before Minerva stopped him. I don't regret eating those delicious potatoes, not one bit nor bite.